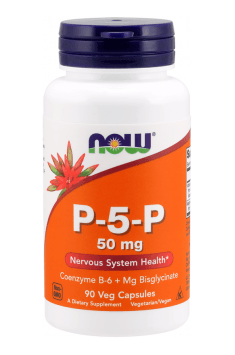 Now Foods P-5-P is the highest quality preparation that is the source of two substances with a synergistic effect on the CNS – pyridoxal 5-phosphate and magnesium. The manufacturer taking into consideration different nutritional preferences placed the effective dose of compounds in a convenient form of vegan capsules with high bioavailability. Pyridoxal 5-phosphate – it is a precursor to the biologically active form of vitamin B6, with is a cofactor of many enzymatic reactions. The presence of Vitamin B6 is crucial to maintaining the proper physical and mental condition. Its deficiencies may manifest themselves in a lowered mood, hormonal problems, and in the long run, also dysfunction of the cardiovascular system. Magnesium in the formula TRAACS® bisglycinate is a form of Albion® chelate – the best available form available on the market. Magnesium cations play a supporting role for the vitamin B6 contained in the preparation, and also have a positive effect on muscle condition. A modern approach to supplementation assumes not only care for somatic health. Hygiene of the central nervous system and regulation of the level of neurotransmitters within its structures have also become important. Stress, a diet based on unhealthy products and lack of proper rest are the factors that gradually cause disorders in neurotransmitter secretion. Fortunately, a small correction of the products included in the daily menu can lead to an improvement of the nervous system function. One of the vitamins with the effect on CNS is vitamin B6 in the form of pyridoxal phosphate. Research indicates that it may help people suffering from depression-related mood disorders. This is due to its positive regulation of the enzyme that converts L-dopa into dopamine. Another activity is to promote the production of serotonin. Both of these substances are responsible for feeling pleasure and joy. In addition, vitamin B6 supports the cognitive functions of the body, which particularly in older people results in an improvement of memory processes. The magnesium present in the supplement supports the action of pyridoxal phosphate, but in a slightly different area. It has been observed that too low blood concentrations of magnesium correlate with depressive disorders. There is a hypothesis that magnesium cations through the regulation of the function of NDMA receptors may positively affect the well-being of patients. Tissues with high energy demand carry out many metabolic processes, which are controlled by a number of enzymatic proteins. They, in turn, in order to perform the proper job, need coenzymes, which are mostly vitamins and microelements. Glycolysis is the simplest glucose transformation pathway, whose high activity is particularly visible in muscle cells. It leads to obtaining a small amount of energy in the form of ATP, necessary for the proper work of the working muscles. The magnesium present in the preparation as an activator of some of the enzyme components contributes to the improvement of the efficiency of the transformations leading to the obtaining of metabolic fuel. The reduced supply of glucose to tissues triggers mechanisms that mobilize high-energy substances. Glycogen is the first metabolically readily available compound. Obtaining glucose molecules from it requires the action of glycogen phosphorylase, an enzyme initiating the degradation process. It is the vitamin B6, or more precisely, pyridoxal phosphate, that acts as its coenzyme, enabling the performance of a catalytic function. The multidirectional effects of pyridoxal phosphate seem to be almost infinite. According to research, it plays a supporting role in the sulfur amino acid transformation pathway. Together with folic acid and vitamin B12, it participates in the reduction of homocysteine ​​that is harmful to vascular endothelium. Clinically speaking, the high concentration of this intermediate transformation product also correlates with the risk of atherosclerosis and its serious complications. It is also worth adding that vitamin B6 is involved in the production of a compound responsible for delivering oxygen to tissues. Due to the activation of the aminolaevulinic acid synthase, it is possible to produce heme, from which the hemoglobin is finally obtained in the transformation pathway. Magnesium also contributes to the maintenance of homeostasis in the system. The most noticeable magnesium activity occurs in skeletal muscles. Competing with calcium cations, it prevents the excessive excitability of myofibrils. This anchor point is used by the athletes who struggle with nagging muscle cramps during exercise. In conclusion, Now Foods P-5-P is a preparation intended for daily supplementation for all those who want to comprehensively support functions of the CNS, and also want to take care of the "metabolic health" of cells. The combination of substances with a similar profile of action allowed placing them in a convenient form of capsules, which are also vegan-friendly. Vitamin B6 displays the activity in the central nervous system; by regulating the level of neurotransmitters, it stabilizes the functioning of neuronal systems. Bearing this in mind, its supplementation may be recommended for people who are struggling with mood disorders or who want to support memory functions. The product is also recommended for those who want to reduce the risk of cardiovascular disease. Effective doses of a daily supply of vitamin B6 range between 50-100 mg. I advise starting the supplementation with a lower dose, gradually increasing it in the absence of satisfactory results.